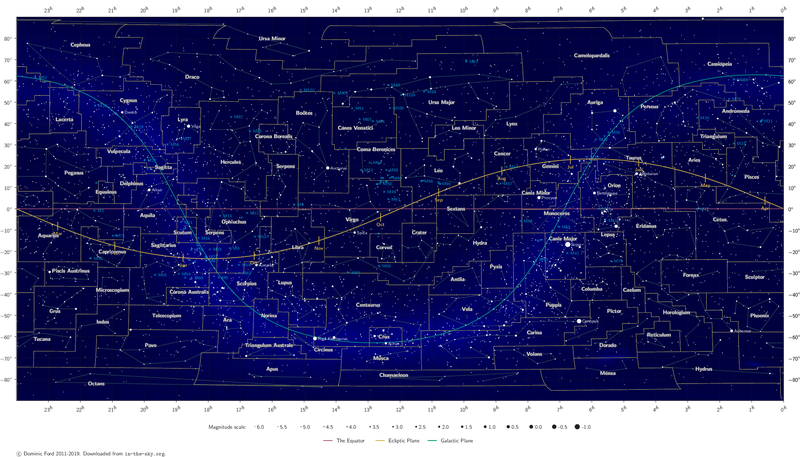 The chart above shows the division of the night sky into 88 constellations, plotted on a rectangular grid right ascension – celestial longitude – and declination – celestial latitude. Two color schemes are available: light-on-dark, recommended for screen viewing, or dark-on-light which is printer friendly. To view the whole sky, click on "expand chart", or use the "pdf" link to download the chart the highest possible quality for viewing in Adobe Acrobat. The rectangular projection used above appears distorted at the top and bottom, just as maps of the world stretch the areas of land around the poles. The sky is a spherical surface – like the surface of the Earth – and it is impossible to represent it on a flat map without distorting some areas. The simple rectangular projection chosen here warps those constellations close to the north and south celestial poles to appear much larger and wider than they are in reality. 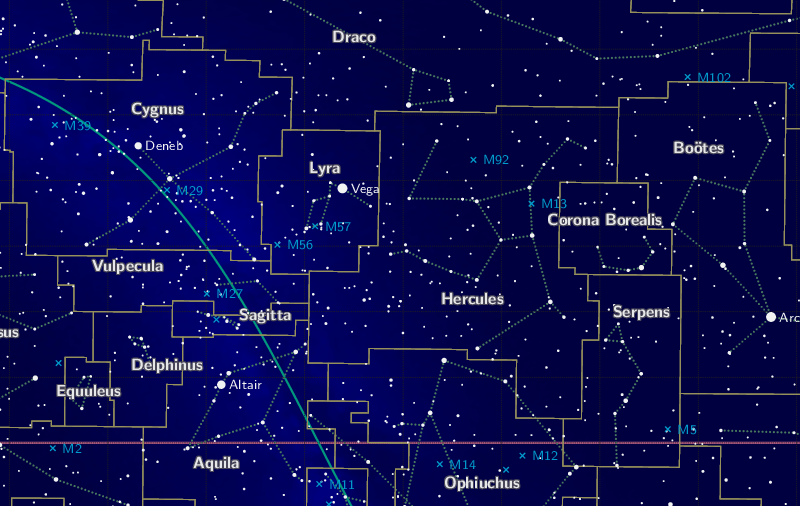 By selecting the "Galactic coordinates", the chart can be viewed in rotated coordinates, in which the plane of the Milky Way runs horizontally across the middle of the chart. Rather than placing the north celestial pole (Ursa Minor) at the top, and the south celestial pole (Octans) at the bottom, galactic coordinates place the north galactic pole (Coma Berenices) at the top, and the south galactic pole (Sculptor) at the bottom.